I’m a sucker for NY style deli sandwiches. I’ve made the pilgrimage to Katz Deli, but still have yet to make it to Carnegie Deli. We’ve had some decent delis up here. There was Nosh which is now closed. There’s also Ben and Bill’s inside of some of the local Price Choppers/Market Bistros/Market 32s. 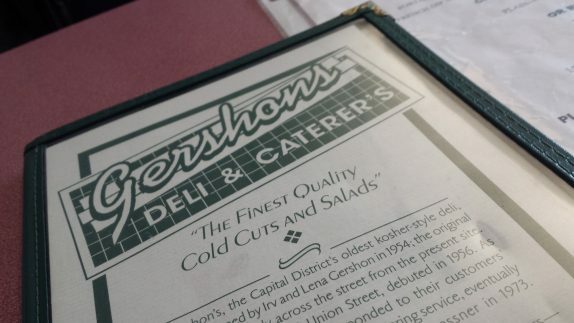 And then there’s Gershon’s on Union street in Schenectady. Being that they’ve been around for over 60 years, it took me an awfully long time to check it out. In my defense, I hadn’t really explored Schenectady much until I moved to Niskayuna. There are a dozen or so eight top tables and 3 or 4 four tops inside, and, at busy times, they do a good job at maximizing the space by seating multiple parties at each in a non-awkward way. But if you’re just an awkward person, it won’t be their fault when you’re awkward. The menu is actually massive. 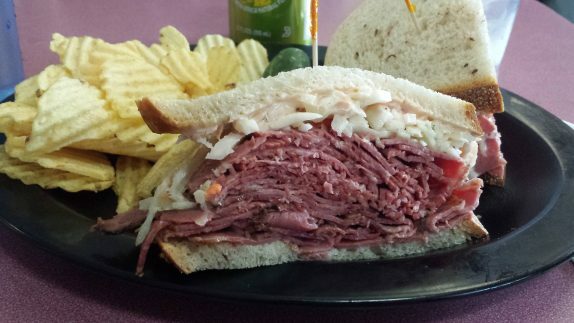 They have multiple types of cole slaw, potato salad, macaroni/pasta salad, and just about every deli style sandwich or item you can think of. Whenever I go to a deli like this, I look to sample multiple meats, usually pastrami and corned beef. 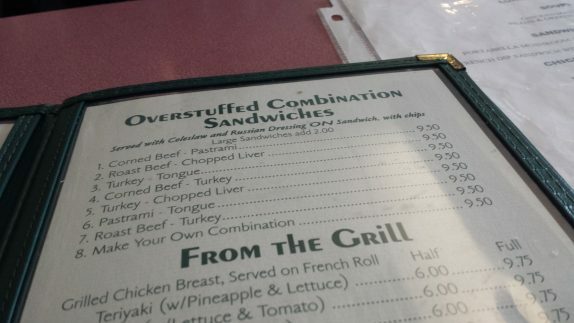 That led me right to their Overstuffed Combination Sandwiches. For $9.50, that got me both meats, Russian dressing, cole slaw, a dill pickle, and some chips. I don’t care if it’s gimmick, but I threw on a Dr. Brown’s Celery soda because, why the hell not?! It’s the type of sandwich you start out by picking up but enough gets lost out the back after 2 bites that you need to employ the fork. That’s not a bad thing at all; as long as it’s not a burrito, I love it when that happens! I felt like the pastrami was the better of the two meats on the sandwich, but honestly, it all kind of gets lost in the bite as you eat through it. 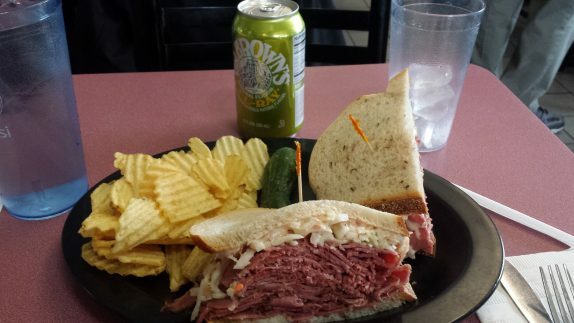 They use a really flavorful rye bread that does what it can to stand up to the bold meats and creamy cole slaw and Russian dressing. The chips are standard issue crinkle cut, and the pickle was probably the weakest thing on the plate. The waitstaff is super nice. Two ladies came over to the table to check on me multiple times throughout the meal, even though it was clear that both were super busy attending to other customers. Just to warn you, if you want to make the trip to the original location of the Carnegie Deli, you only have a few weeks left. It’s closing at the end of the year.